Dixieland jazz band at the Prix de l'Arc de Triomphe, Hippodrome de Longchamp, Paris. 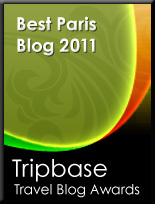 Today marks five years of blogging from Paris: 2,210 posts; many new friends; much travel and unexpected opportunities. Laughing children playing the universally-popular Tug-of-War in Bungamati, Nepal. When my daughter was about three years old, we were on a plane from New York to Amsterdam. She and a little Japanese girl spent at least an hour giggling and playing "Rock, Paper, Scissors" together, even though neither spoke the other's language. These girls reminded me that a smile transcends language. The boys laughed in the background as this young beauty posed, but were shy about having their own photos taken. Meanwhile, political games continue as Nepal remains without a government. When I was In Kathmandu in November, government corruption was often the topic of conversation. Coffee shop at a ferry crossing, Amsterdam. Mais oui, la vie est belle - if a bit hectic. David and I are just back from a lovely trip to Amsterdam, bearing red ribbon-tied keys for our next abode. Alas, our Paris apartment now looks as though a cyclone hit, with things piled everywhere, waiting for the moving company to bring boxes. In Amsterdam, we went to the Rijksmuseum yet again, where an exhibit of Gabriel Metsu's paintings was the star. I never tire of the Dutch masters and their remarkable use of light, particularly Johannes Vermeer. I could look at his paintings for days. Both The Little Street and The Milkmaid are on display; Girl with a Pearl Earring is at The Mauritshuis Gallery inThe Hague. Oddly, none of Vermeer's paintings are at the museum in Delft, where he lived and worked. Perhaps it's an insurance issue. One of the Rijksmuseum's most famous attractions is Rembrandt's The Night Watch. A group of schoolchildren, probably 8 or 9 years old, was sitting spellbound on the floor beneath the wall-size painting, as their enthusiastic teacher told them stories about each person depicted in the painting. The Rijksmuseum also has recent photography acquisitions on display, including abstract architectural images from Man Ray and black-and-white documentary photographs by Robert Frank and other 20th-century greats. In Holland, we had casual lunches at bistros in Amsterdam and Utrecht. I bought glittery magnolia blooms on sale for half price. We had dinner at an old favourite (where lobster bisque is my standard choice) restaurant in the Museum and Fashion District. The next night, we enjoyed a more festive meal with new friends in a bijoux town. Earlier, we bought an American retro-looking chrome refrigerator, to be delivered the day I arrive to greet the movers. One afternoon we walked down a cobblestone road to find a ferry crossing flooded, with deep water standing in riverfront property. Only the tops of fenceposts were visible. Later when we mentioned the flooding to Dutch friends - who are used to dealing with wayward water - they shrugged. Apparently such flooding is seasonal and to be expected, as snow melts. Look beyond what's in front of you. See the bigger picture. But sometimes the best part of the picture is the frame. Photo taken through patterned concrete wall opening in the Himalayan foothills, Nepal. Prayer candles, Swayambhunath Temple, Kathmandu, Nepal. Offering prayers for the victims of ignorance and hate. "One can overcome the forces of negative emotions - like anger and hatred - by cultivating their counterforces: love and compassion." - The Dalai Lama. The Kumari, Bungamati, Nepal. The Kumari is considered by Hindus and some Buddhists to be the living embodiment of the goddess Taleju. The child is selected by religious leaders after passing a series of tests to determine her innocence and worthiness, according to Shambu, my Nepali guide. Ceremonial dress on a religious holiday. I told the Kumari she was beautiful and she kept repeating the word in exaggerated syllables "Buw-tee-full." The Kumari's lovely attendant - possibly her mother - who looks after her. See more Nepal portraits on my website here. Time to lighten the load. No doubt about it: moving is stressful. I've lived in Paris longer than any place in my adult life, yet it never has felt like home. Amsterdam, where I've never lived (but have visited many times over the years) always has tugged at my heartstrings. Happily, we're moving to the Netherlands in just six weeks. And I'm on a mission to lighten the load! Am going through possessions and giving many things away or tossing them. Am moving only my favourite and most necessary things (but four pieces of furniture and quite a lot of art must remain in France, as the beautiful criss-cross timber beams and architectural features of the Netherlands maisonette present decorating challenges). Hard to believe that during my years as a reporter, my daughter and I moved to the Middle East and back with only four suitcases! I've spent the last 11 years in Europe frequenting brocantes, flea markets and antique shops - "nesting" - to make up for all the items lost during our travels. Now I've collected too much, so am letting go of some treasures. If you're in Paris, I have two huge stacks of design and decor books to give away. The catch is that you have to come pick them up - soon! Email me ASAP if you're interested. Hope your year is off to a good start! Photos (above) taken in Bhaktapur, Nepal. Time to shine. Adventures await! Top two images taken at Bungamati, Nepal; little girl's photo near Swayambhunath Temple, Kathmandu. P.S. Head over to Got Saga for an article in which I reveal the identity of The Secret Brocante!